This is a write up on a solo ride from Chennai to Delhi covering 3,350 km in 9 days. If you are interested in any of this episode, you can read the detailed pages below. For places covered and photo only, click here. Photos taken using phone only for this trip. As my camera is sold and lens was sold to go for this trip :P Traveling vs Photography, had to pick travel. 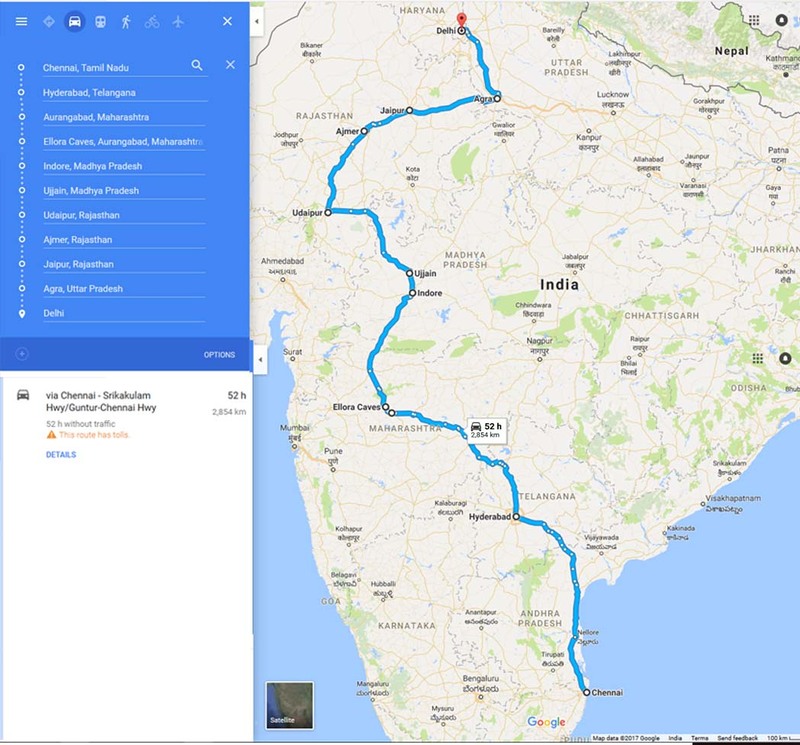 Here is the how the route turned out to be when the trip got completed. After confusion between Cambodia or Delhi, decided to go on a solo bike ride to Delhi. Moving northwards, stopped in Hyderabad for my favorite Biryani. Day 3: Spanner in the plan. Roam in Ellora caves and cut short Aurangabad. - Udaipur city palace, one of the best pic of this trip. Very well maintained palace. - Jag mandhir - Could skip, worth for the city and palace views. - Ajmer Dharga - Got caught in the cob web of narrow streets. - Amer fort - Another best pick of this trip. Splendid history and the Muhal connection. - Jaipur citi palace - Commercial center than a palace to tour. - Janthar manthar - Wisdom and vision. - Hunting for Dhal Batti - My new found love. - Fatehpur sikri - Fell in love with this beautiful place. - Taj Mahal - Crown jewel of this trip. - Red fort - More of a city than a fort. Just massive. - Qutub minar - Majestic in structure, size and history. Planned Unplanned Trip 1: Start in Thiruchandur and end in Tenkasi. Planned Unplanned Trip 2: Start and stop in Coimbatore. Surprise till the end. Planned Unplanned Trip 3: Keep riding west, covering Karnataka and come back to Chennai. Planned Unplanned Trip 4: Reach Mumbai, plan for to and fro planned on the way.